Just like an Italian Mamma, grandma Barrett kept a watchful eye on the bread making and baking in her kitchen. And because her recipes have evolved and matured into the Barrett’s Ridge range you know and love today, we thought it only fitting to add another ingredient that takes time and dedication to reach pure perfection – Italian Cheese. The Barrett’s Ridge bread bakers recommend pairing our Italian Cheese bread mix with a Weiss of your choice. The fruity notes of Weiss beer perfectly complement and cut through the deep cheese flavour. Pour entire contents of Barrett’s Ridge Italian Cheese into a bowl. 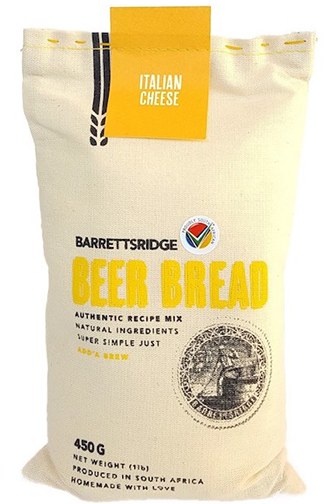 Pea soup is the perfect combination for our Barrett’s Ridge Italian Cheese mix because its flavours lay the right foundation to support the star ingredient – the beer bread of course. This beer bread mix is perfect for any experimental baker because you can try so many different things with every bake you make. We recommend adding jalapenos, cheddar or figs. Your mamma loves you. Basta! Send her this suggestion! Top your Barrett’s Ridge Italian Cheese beer bread with marmalade. The zesty bite of the marmalade will bring out the flavours of your chosen Weiss, making it a perfect mix of savoury and sweet.